UI graduate Phyllis Seltzer has worked at perfecting heat transfer printmaking. 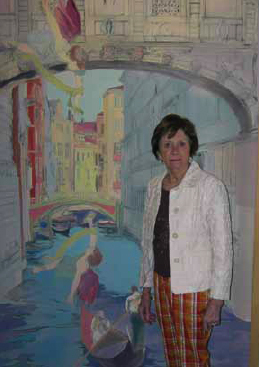 Phyllis Seltzer poses next to one of her colorful masterpieces. Most artists would consider their work done when they put the finishing touches to an oil painting. For Phyllis Seltzer, that final brushstroke is just the beginning of a rarely-used technique full of exciting possibilities. Seltzer, 49BFA, 52MFA—among the first graduates of the UI's famed printmaking program and a former student of Mauricio Lasansky—has spent 30 years perfecting the technique of heat-transfer printmaking. Seltzer's work predominantly focuses on urban architecture and scenes from city life. Inspiration comes from her hometowns of Cleveland and Venice, Italy (where she spends two months out of the year), as well as the magnificent buildings, skylines, and unexpected views of other favorites like New York City and Chicago. As she explains on her website, phyllisseltzer.com: "I am preoccupied with the actual world and yet wish to design that world— structure it—with color, line and technical means so that I create my own aesthetic." After she spends months completing an oil painting of a cityscape, Seltzer interprets the work anew through heat-transfer. To create prints that offer fresh perspective, depth, and color, Seltzer scans sections of the original work through a color printer onto heat transfer paper. She glues and collages these papers together for an overall image, then flips it face down onto a large sheet of archival paper. Finally, she places this composition in a 300-degree heat press to create a print that does not fade when exposed to ultraviolet light. At 81 years old, Seltzer works seven days a week, which has resulted in quite a prolific career. Her art appears in more than 30 public and corporate gallery collections, and she's participated in more than 50 domestic and international exhibitions. Even after three decades, the heat-transfer process continues to challenge and inspire her. "The potential of this medium—there are so many things you can do. You can enlarge a work, make it smaller," she says. "The possibilities are limitless."